Route 1 // 10:00am - 1:30pm // 6 stops. 2.5 mile total route. This route is accessible to bike, jog, and even Streetcar stops. Self-driving is also an option. Route 2 // 9:30am - 12:30pm // 5 stops. 2 mile total route. This is the most Streetcar friendly route. This route is also accessible to bike, jog, and self-driving is also an option. Route 3 // 9:30am - 1:00pm // 6 stops. 2.5 mile total route. This route is accessible to bike, jog, and even Streetcar stops.. Self-driving is also an option. ​Route 4 // 10:00am - 1:35pm // 6 stops. 16.25 mile total route. Self-driving route. Route 5 // 11:00am - 2:15pm // 5 stops. 16.5 mile total route. Self-driving route. Route 6 // 11:15am - 2:00pm // 4 stops with a bonus stop from 2:30-3:00pm. 2.25 mile route + 15 miles to bonus stop. Self-driving route. - You will receive a confirmation email from one of us within 36 hours after your ticket purchase. Be sure to check the email you bought the tickets from, including your spam folder. Your physical ticket(s) will be mailed to you (unless within 4 days of the event, in which case they will be held for you at will call at the start of the event). - Tickets include admittance to all stops on your selected route during the designated times (includes a drink or chocolate sample, and short, educational presentation at each stop), and an event bag. All drink, and even edible, samples are at the discretion of participating shops, and planned ahead by their team and staff. - Children are welcome, and there are sometimes caffeine-free options. There are occasionally alcohol-based coffee drinks. All drinks are at the discretion of participating shops. If you plan to bring a child please contact us about ticket need, etc. - It doesn't happen often, but there have been shops on Caffeine Crawls that have closed down, or had a business emergency in between route planning and the actual Caffeine Crawl. We do the best we can to rearrange and fill that void. - Caffeine Crawl and The LAB will not be held responsible for any travel-related incidents while attending Caffeine Crawl. By purchasing a ticket, you agree to the Terms & Conditions, maintaining full responsibility for your personal and vehicular safety, and your own items, while traveling between shops by foot, car, bus, city transportation, or bicycle. ROUTE 1 Ticket Holders: This route 1 is a Friday route that visits 6 different locations beginning at 10:00am, sharp. Starting location is at Hank's Coffee & Wine (under new management) at 1227 N Walker Ave, Oklahoma City, OK 73103. *Please allow time for construction in the area. Route 2 Ticket Holders - This route 2 is a Saturday route that visits 5 different locations beginning at 9:30am, sharp. 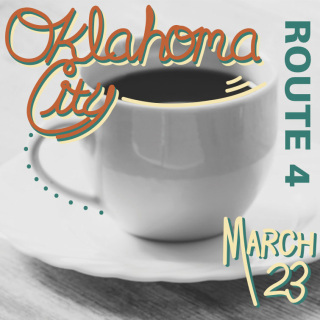 Starting location is at Clarity Coffee (431 W Main St, Oklahoma City, OK 73102). Route 3 Ticket Holders - This route 3 is a Saturday route that visits 6 different locations beginning at 9:30am, sharp. Starting location is at Stella Nova Coffee (119 N Robinson Ave, Oklahoma City, OK 73102). ​Route 5 Ticket Holders - This route 5 is a Saturday route that visits 5 different locations beginning at 11:00am, sharp. Starting location is at Aspen Coffee Company (180 W 15th St #140, Edmond, OK 73013). 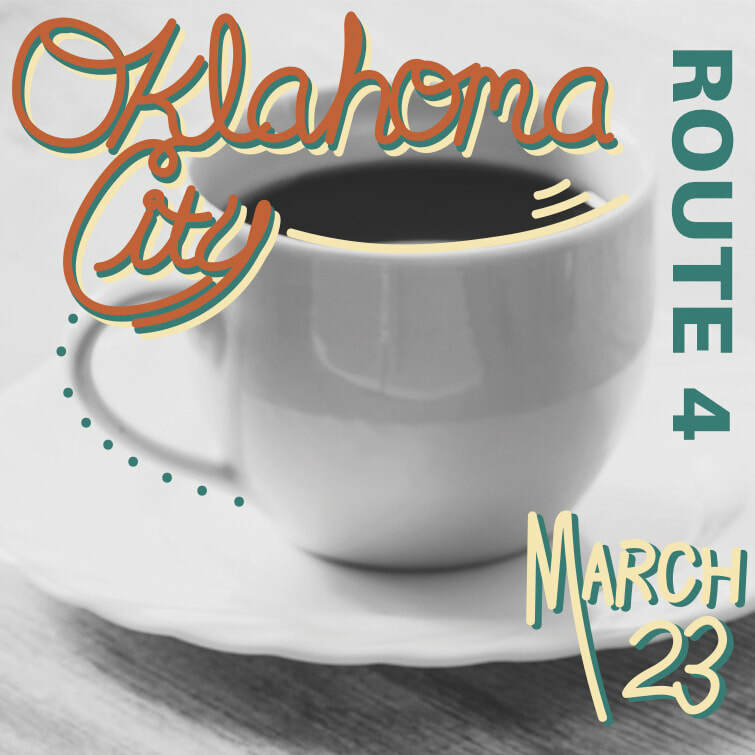 Only 3 tickets left!This route 4 is a Saturday route that visits 6 different locations beginning at 10:00am, sharp. Starting location is at Cuppies and Joe (727 NW 23rd St, Oklahoma City, OK 73103). Other stops include t, an urban teahouse, EÔTÉ Coffee Company, Leap Coffee Roasters, Cafe Evoke, and this route ends at Aspen Coffee Company at 1:35pm. Total distance of the 6 locations is 16.25 miles. This is a self-driving route.